Hungary is flooding with immigrants, refugees from the Middle East and Africa fleeing the aftermath of US military interventions instigated by Barack Obama. Transiting Pluto in Fourth House square Hungary Mars (ruler of Seventh): a destructive force (Pluto) on the land (Fourth House) involving "others" (Seventh House). Transiting Neptune (foreigners) entering Sixth House (population). Transiting Jupiter (expansion) and North Node (increase) entering Twelfth House (foreigners). 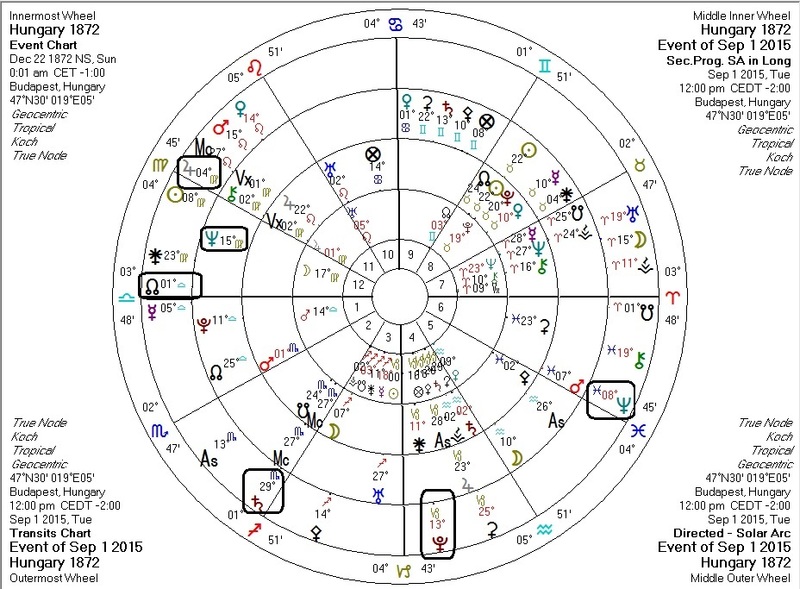 Transiting Saturn conjunct progressed MC: visible troubles. Solar Arc Neptune (dissolution, foreigners) conjunct Hungary Moon (people, culture, race). "Hope and Change", European style. September 4, 2015 at 8:41 PM https://www.lewrockwell.com/2015/09/anne-williamson/mass-migration-madness/ Very worth reading.